Original Release Notes: Conceived during the sub-freezing Polar Vortex of 2014, the next Guided By Voices record is Cool Planet. It�s another wineskin full of great songs, recorded in a single proper studio for the first time since their inexhaustible reformation. There�s some unusually consistent and consistently awesome production on display, thanks to the array of vintage equipment on offer at Cyberteknics Creative Studios in Dayton, Ohio. 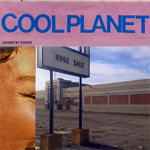 Cool Planet also offers a weighty crunch that will lay you flat, perhaps due in part to the (re-)addition of late-version Guided By Voices tub-thumper Kevin March on drums. Robert Pollard has talked in recent months about having refined his approach to songwriting (as if that was a thing that needed to happen) and the tunes he�s written for Cool Planet stack up against the best he�s ever done, including the hard-hitting title track, which just begs to be played live. Guitarist Tobin Sprout steps up with (among others) a Bowie-esque song (�Psychotic Crush�) and a Beatle-esque number (�All American Boy�). Look what Guided By Voices have done for the world since reforming in 2010. Six high-quality full-length albums in less than four years. And that�s not counting EPs, singles, tours, or solo records. If the sorry state of the present day indie-, alt- or just plain rock landscape is the disease, Guided By Voices is the cure! Do not take in moderation.